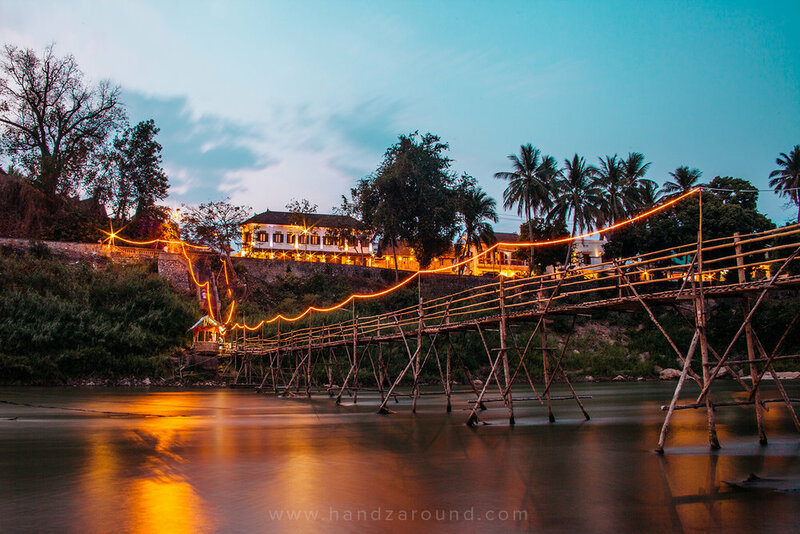 Luang Prabang is a hidden gem of Southeast Asia. We really loved this little town (it even made number 1 in our 'Top 10 (Alternative) Cities to Visit in the World in 2018') and we will surely come back there sooner rather than later. Luang Prabang City Video Guide below! Have a stroll along the Mekong River or rent a boat and drift around at the sunset. Wake up very early (before 6am) to see Monks' alms giving and visit Luang Prabang's day market right after. Visit Haw Pha Bang temple. It's a very big and beautiful building right in the town centre. Walk around Wat Xieng Thong temple complex and if you're lucky, spot young monks living nearby. Go to Vat Visounnarath, where you will find an old stone stupa-like monument and an enormous gnarly tree. 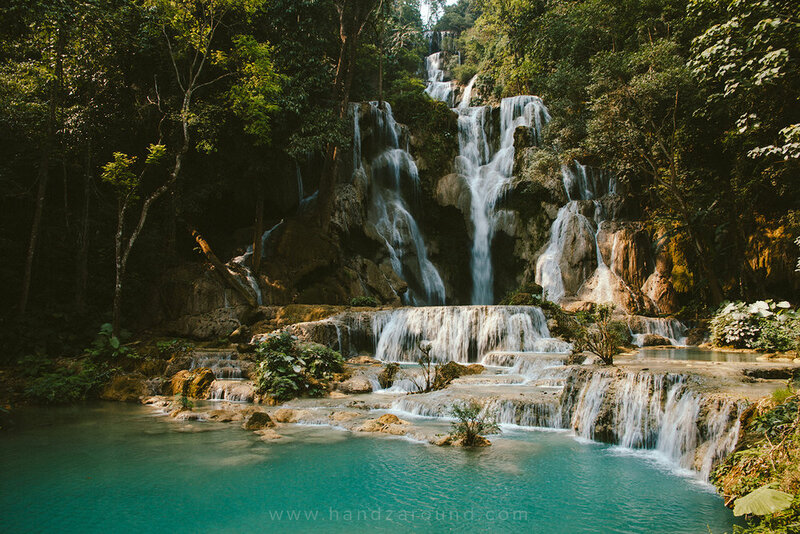 Rent a scooter and ride to the stunning Kuang Si Waterfalls. Wake up early and get there around 8am to avoid crowds of tourists coming about 10am. Go for an elephant walk with MandaLao Elephant Sanctuary & Tours, which is a non-riding intimate experience. You will enjoy their beautiful site near the river and you'll have fun feeding, bathing and walking alongside their jolly elephants. Walk the Nam Khan Bamboo Bridge and cross the river walking on this light shaky structure! Have something yummy and stock yourself with all 'the elephant pants' (jokes!) at the Luang Prabang night market. Have a drink at 525 Bar - this fancy place located couple of minutes away from Luang Prabang's main street has probably the best variety of alcohols in town! It may be a bit pricey and it's not really in Laos style but it's a great place to go to and unwind whilst having a delicious cocktail for a special occasion. Watch sunset near the Nam Khan Bamboo Bridge - it's a beautiful spectacle when the day turns into night and the lights get turned on. Watch 'Chang' movie in Victoria Palace Hotel, every day at 7pm, entrance free but you need to buy a drink. It's a classic about a rural family filmed in 1925! It shows the daily life and interactions of humans and animals, especially elephants. We have no idea how in 1925 the two cameramen, who shot 'Chang', managed to get these sort of shots in the jungle - props to them! The street has a lot to offer! Street vendors are pretty much everywhere and you can always grab a steam bun around the town centre. You can also come in to a local restaurant and order a yummy noodle soup. If you're missing some western food, head over to Novelty Cafe - you will find there the lovely owner, Nanta, her awesome dog, George, delicious coffee, amazing cakes and great breakfast, lunch and dinner options. And the night market has plenty of options too, although they're not always the freshest. Thongbay Guesthouse is an oasis of peace on the outskirts of Luang Prabang. With your stay comes a wooden house with the view on the lush green garden or beautiful Mekong, comfortable beds and big bathroom, yummy breakfast, friendly staff and a bicycle for you to use when you please! The latter makes it easy to get to the town in 10-15mins. We were guests of Thongbay Guesthouse but as always all the opinions are our own.